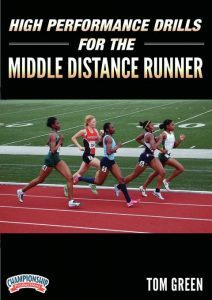 Coach Christensen is a highly regarded distance coach. His high school teams have been ranked in the national top 10 eight times. He has coached 13 Minnesota State Championship-winning teams and 27 individual Minnesota State Champions. 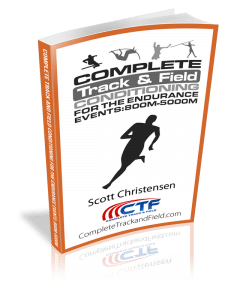 Coach Christensen has also spent 14-years as a USATF Level II endurance lead instructor and currently serves as lead endurance instructor for the USTFCCCA Coaching Academy. As the track season winds down in the spring, the distance runners enter a time that sport scientists call the transitional phase in the annual plan. Track is an unusual sport in that there is no one time that all of the athletes are finished with their season. An athlete that finishes up with a junior varsity meet or a sophomore championship meet may end their season more than a month earlier than the athlete competing at the state championships. And of course the very best runners may go on to run at an all-star meet or USATF Junior Nationals. It is just not a clean ending for everybody. The transitional phase serves to re-align the training program of all of your distance runners while also providing a time for regeneration and relaxation before summer training for cross country runners starts. How much time should I take off from training coach? This is a frequently asked question once a runner competes in their last track meet. The answer is not intuitive. The fact is the runners with the lowest training age need the most time off to regenerate, while the runners with the highest training age usually need much less time. A young runner should take three to four weeks off from training, while the older runner two to three weeks. Note that there is a difference between summer training for cross country and just running. Training is consistent everyday running. If the athlete gets bored during this regeneration period and is anxious to run a little bit then they should feel free to step out and run a few “easy miles”. Just no structured training or set mileage patterns. 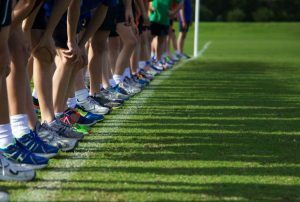 Around the third week in June is the time most good cross country programs get organized for their summer training. For most teams in this country that means about eight weeks of summer training camp before the actual cross country season officially begins. 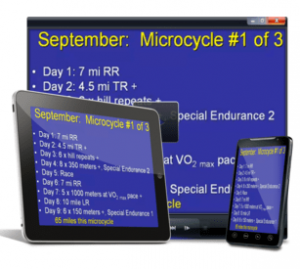 Because there are so many components to a middle distance training program during the competitive season, it is necessary to set up microcycles of 12 days. Since not quite as much anaerobic work is need in spring long distance and fall cross country these microcycles are set up as complex nine day training periods. During the summer when general preparation is the target training, it is easy to set up microcycles of seven days which fit the calendar nicely and allows both coach and athlete to easily monitor summer training mileage. If you are setting up an eight week summer training program then a good number to choose for a total distance goal is 400 miles or 50 miles per week on the average. This total would be appropriate for those athletes with a training age of two or greater. If you are planning on giving a t-shirt or other reward this would be the magic number. 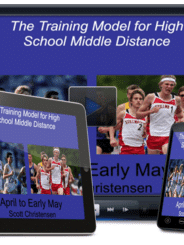 The first three weeks of the summer training for the cross country plan should be very basic with nothing more than workouts done at the aerobic threshold or what can be accurately described as “gossip pace”. The first week should contain six runs of five miles each day. Advance mileage over the next three weeks in accordance with the “20% rule”. That is, never increase the weekly total by more than 20%. After three weeks of general mileage, you should prescribe two workouts per week that go beyond the training effect of aerobic threshold runs. These would be strength and power runs. For the next five weeks do a hill session once per week. Select a hill to repeat run that is far enough away from school to add a three-mile warm-up and end with a three-mile cool-down. The hill itself should be about 200-250 meters in length and should be of a sufficient grade to tax the body’s strength component. Run the hills as hard as one can and then jog to the base and repeat. For power, aerobic power is the training component and this is the definition of VO2 max. On the fourth week set up a two-mile run for time on the track or accurately measured flat stretch of road or trail. The value each athlete records are their VO2 max velocities and will be used for the next four weeks in training. On the fifth week break that two-mile time in half and have the athletes do three to four times one-mile repeats at their individual value with equal time rest. On week six, using the same velocity have the athletes do seven or eight times 800 meters at VO2 max pace with equal time rest. Weeks seven and eight can be the same sorts of workouts. Scientists say it takes 27 weeks to fully develop VO2 max in a training period so do not wait until your fall season actually begins. If you do, your athletes will be late for the party. Beginning week four, a true long run constituting 20% of their weekly mileage total should be done, once per week in a single session. For most of your runners that is a 10 mile run at their aerobic threshold. If an athlete wants to run a couple of 5K races to test their fitness over the summer encourage them to that and call that their VO2 max workout for the week. Summer is also a time for the coach to regenerate and relax. Make sure that occurs as well. Fall is not that far way and the meat-grinder starts all over again. Simply put, the element iron is necessary for a hemoglobin molecule to hold oxygen to the red blood cell. While the average person only has about four grams of iron in their entire body it is essential to keep the level as high as possible. Red meat is the best source of iron for the body. Iron found in red meat is called heme iron and since it has already been absorbed and processed by another animal it is most readily absorbed by humans as they eat the red meat of the animal containing the iron. Iron supplements found in vitamins, etc., is called earth iron and has not been processed by another animal and is not readily absorbed. Humans absorb about 85% of heme iron and 18% of earth iron that they ingest. Humans, like all animals have deeply rooted body rhythms. There is no better example of this than sleep patterns. Sleep is the very best recovery tool so getting into a sleep routine is crucial.Adjusting to about the same length of sleep every night is important to recovery for distance runners. Binge sleep is not an effective recovery tool.Taking naps in the late morning or early afternoon my aid in recovery for a distance runner. Taking a nap after 3 pm merely disrupts the night-time deep sleep rhythms.